A photo of the grains was sent to Seaton Smith of GF Harvest who is very well versed in identifying wheat, barley, rye, and oats. 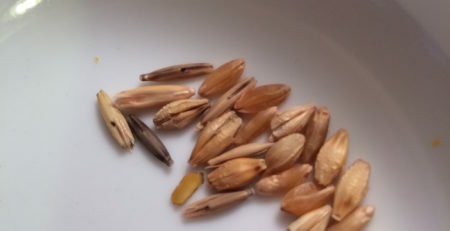 The two grains in the photo (posted with permission) appear to be wild oat (thin, darker grain) and barley (or possibly wheat). The grain that appears to be barley is very hard. An oat groat would be softer. Due to the number of complaints we’ve received dating back to October 2016 about foreign grain in Edison Grainery lentils, including their French Green Lentils and Beluga Lentils it may be prudent to avoid lentils from this manufacturer at this time. This recommendation is not made lightly as we know how many folks in this community use Edison Grainery products. This recommendation pertains to their lentils only. The current complaint pertains to a bag of lentils NOT certified by GFCO. According to GFCO, they have not certified Edison Grainery since the beginning of 2016. However, foreign grain has been found in both GFCO certified and not certified bags of Edison Grainery lentils. 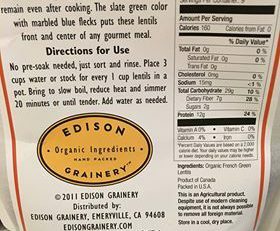 Edison Grainery now appears to be marking products as “verified gluten free.” Interestingly, as of this morning (11/15/17), neither the French Green Lentils nor Beluga Lentils are available for retail sale on the Edison Grainery website. As a general reminder, under GIPSA standards (Grain Inspection, Packers & Stockyards Administration), lentils are allowed to contain a certain percentage of foreign grain, including wheat, barley, and rye. As a precaution, please make sure to pick through dry lentils carefully and rinse them very thoroughly under running water. 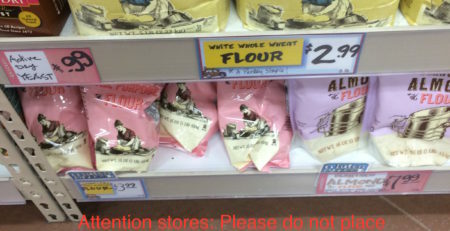 Thank you to the consumer who reached out to Gluten Free Watchdog. The consumer reached out to Edison Grainery. At last report, the manufacturer had not yet responded. 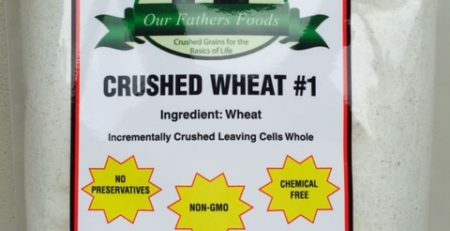 Gluten Free Watchdog has previously reached out to Edison Grainery about this issue. Their statement is included below. The email below was received from Edison Grainery on December 14, 2016 and first posted on Gluten Free Watchdog the same day. It is posted in full and unedited by permission. “Thanks for joining us at Edison Grainery. We are indeed concerned about each bag of ingredients that we sell. Being Celiac too, we are aligned in the effort to provide quality safe food. As with all every item – we send a sample to an independent lab for microbiological and gluten levels analysis. Our standard is <5ppms. Lot specific lab results are posted online to allow customers to make an well informed purchase – or not . Until January 20th – the target installation date of a state-of-the-art color sorter and cleaner is installed – all items from the vendor in question have been placed into our HOLD & Release program. Managing our food safety hazards and assessing our risk is an on-going preoccupation for Edison Grain Inc. This obsession goes hand in hand with our commitment to provide high quality, healthy food to our customers. We manage our exposure by developing strict in-house policies and adhere to legal and regulatory requirements as well as specific standards set by internationally respected agencies. Our systems are verified through a framework of internal and external audits and certification programs, HAPC certification thru NSF, Organic certification via OTCO and Kosher certification through Chicago Rabbinical Council (cRc) and we have consistently met their standards. Foundation of Our Food Safety Program is Hazard Analysis and Risk Assessment. To determine risk and identify the need for control measures, we perform a hazard analysis on each ingredient and its condition in receiving, production, storing and shipping. To determine potential hazards we consult data from a variety of outside sources including legislation and regulatory guidelines (e.g., in identifying allergen and pathogen hazards), research and technical documents, recall and alert notifications (e.g. FDA/USDA/OTCO), general news and information outlets, and customer comments. All Data is Reviewed and Analyzed during Our Validation Process. Our control measures begin with vetting and approving our suppliers. In the ever increasing complexity of a verifiable food supply chain program, we pride ourselves in developing both professional and personal relationships with our suppliers. Recognizing the significant impact of globalization, we have added a Regulatory Compliance Officer to administer our Supplier Approval Program which includes obtaining, reviewing, assessing and keeping data current on vendors. A hallmark of our control process is that every lot of every ingredient is submitted to an independent ISO/IEC Standard 17025:2005 certified lab for microbiological and gluten level testing. The results serve as our lot specific Certificate of Analysis (COA). We share product information and COAs with our customers on our websites: edisongrain.com and edisongrainery.com . Edison Grain’s control program continues throughout production, including measures such as metal detection and allergen control, and does not end until the product has shipped. Of Paramount Concern is Sanitation. Management’s real-time observations documents that proper equipment cleaning procedures have been followed. It is an essential requirement that the procedures be monitored and validated, and clearly documented as it actually occurs. Variations are noted on daily reports. Verification of our SSOP includes visual, ATP swabs and routine 3rd party examination. Our employees are trained in all SOP categories. Full records of all training are kept as part of our protocols. Customer Satisfaction is our Guide Post. Edison Grain Inc. would undertake strict food safety measures regardless of regulatory mandates or commercial standards. Simply put, it is the right thing to do. To build a business dedicated to selling organic, gluten free products (tested for <10ppms) without being equally committed to the safety of that food would not make sense for us or our customers. To that end, we have allocated significant financial resources and employed aggressive risk management measures to ensure food safety and quality. In the first quarter of 2017, we are excited to add a state-of-the-art Optical Laser Color Sorter which will detect and remove defective product and foreign material. We run a tight ship, and we are proud of it. It makes sense that people on a GF diet often have continuing health issues. Pretty scary stuff! Even through Edison’s is using, what sounds to be very careful practices, there will always be human or machine error. So, if we were to rinse the lentils many time, using hot (?) water, if the mystery grain were removed, would they be safe to eat? 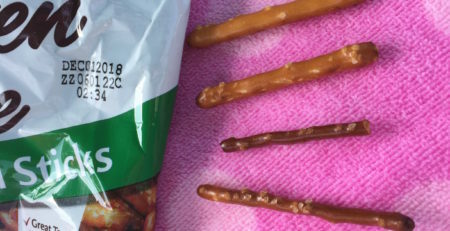 I too found a grain of barley in a small bag of Edison lentils claimed to be gluten free, which to me makes them about the same as any non-gluten free brand. Since I also did not care for their customer service, I have not ordered anything else from them after my first order.